Arriving late to her interview and still drunk from the night before, Kate makes a fool of herself in front of the panel of editors, who are led to believe that Kate is a raging alcoholic. Not all hope is lost, however. Kate is later approached by the editing team from The Line and given another chance to redeem herself. The only catch, though, is that Kate must submit a gossip column piece on a major celebrity attending rehab, and Kate must enroll in rehab herself to report on the celebrity and be reconsidered for a position with The Line. As Kate undergoes rehabilitation for her alcoholism, she unexpectedly develops a handful of close friendships with people that could potentially end up getting hurt from her undercover project. Kate must then determine whether or not working for The Line is a sacrifice worth making in exchange for her new friendships. At first glance, Spin seems to be a parody about a 30-something woman's binge-drinking life and the careless, selfish ways in which she manipulates and takes advantage of her friends. The events leading up to Kate's disastrous interview are pretty sickening and pathetic, though funny. Spin doesn't become addicting (haha, no pun intended!) until Kate evaluates her drinking problem shortly after arriving at rehab and realizes that she really IS a genuine alcoholic! McKenzie positions this very discovery in a manner that allows her readers to learn of this fact at the same time Kate does; resulting in our having new respect for Kate and renewed interest in a plot that will actually lead to the healthy development of our main heroine. The pop-culture aspect of Spin is also very fun, and provides us with a deeper glimpse into Kate's personality in regards to her taste in music. I actually went out and downloaded a few of the tunes mentioned in the novel so I could feel more involved with the story as I was reading it. I had the same reaction when I read Mark Z. Danielewski's House of Leaves and listened to his sister Poe's Haunted album (seen below), which went along with the book. McKenzie even provides readers with Kate's playlist at the end of Spin. How neat is that?! Best of all, the details of Spin's final outcome are unpredictable and satisfying. It's always nice to walk away from a book and realize that in the days since you read it, you are remembering bits and pieces you enjoyed and can relate to. Readers who enjoy the chick-lit, romance, and fiction genres will absolutely love Spin. Adults who like to read teen and young-adult (YA) books will also like Spin because the style is very similar in regards to tone and humor. More specifically, women who have had wild drinking nights and horrifying interview experiences in their lifetime will also appreciate the brutal honesty of Spin and Kate's transformation. I will reluctantly admit that I can personally relate, which is probably another reason I enjoyed the novel so much! Click on the pictures of the images below to review these items in more detail on Amazon.com. 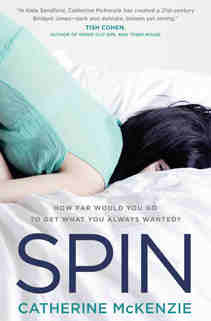 Does Spin remind you of any other novels you have read? If so, which ones? Hmm. At first glance, I thought I would definitely not like this protag... who would waste a desired opportunity for a dream job?! But your review convinced me that she's redeemed and the book is more than what I thought initially. Thank you!